My newest creation is sure to WOW! that special girl in your life. The sweet princess fairy bear on the belly band slides off to reveal a multi-dimensional pop up castle. 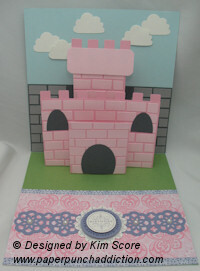 Change up the colors for a princess wedding card instead of birthday. This full color step by step tutorial in pdf format is only $3.95. This design uses Stampin' Up! paper punches, card stock, designer papers, stamps and embellishments. This is a digital class that is delivered via download. After completing payment, you will receive an email from Fast Wagon with a link to download the class. If you don't receive the email, please check your spam box before contacting me. If you plan on ordering classes from me in the future, you may want to add service@fastwagon.com to your address book to avoid spam filtering. Please note that the download is available for a limited time and limited number of downloads. Please make sure to save the file after downloading and opening it. seus mimos são lindos! PARABÉNS! te seguindo, espero ser aprovada para retornar sempre.